Entire sent from Warrington via Liverpool and New York to Philadelphia, May 1841. Ship Mark: 'SHIP LETTER LIVERPOOL Crown' Tabeart type S15, in use 1838-1863. Ship Mark: 'NEW YORK / SHIP / JUN / 20'. 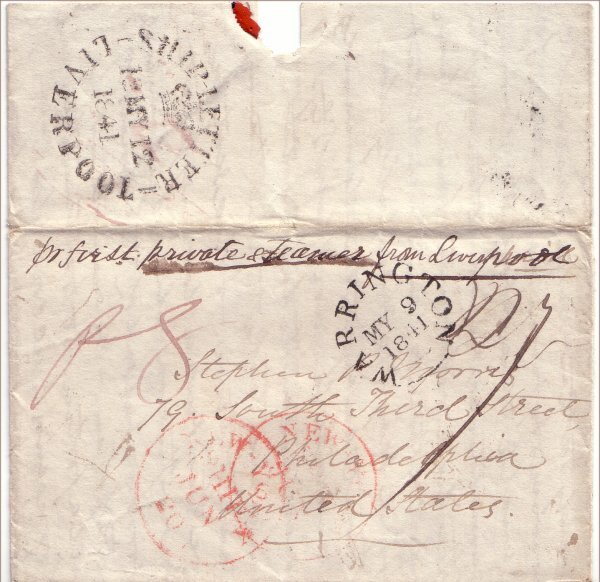 The GB outbound ship fee of 8d per ½ oz including inland postage applied from 7th January 1840 to 1st January 1858. The US ship fee of 2¢ per letter applied from 1799 to 1863. The US internal mileage charge applied from 1st April 1816 to 1st July 1845.